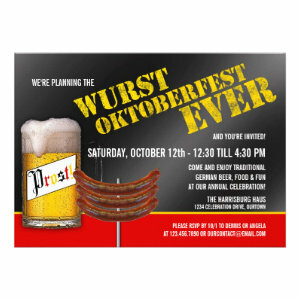 Oktoberfest is the world's largest Volksfest which is a beer festival and travelling funfair. 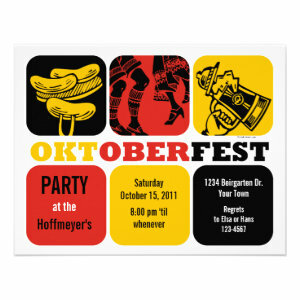 A traditional German festival Oktoberfest has become popular worldwide in many different countries and cultures. 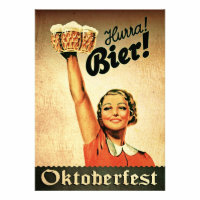 Held annually in Munich, Bavaria, Germany, Oktoberfest is a 16- to 18-day folk festival running from mid or late September to the first weekend in October. 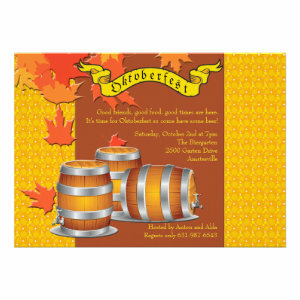 These Oktoberfest invitations feature lots of festival goodies like beer, pretzels and sausages. 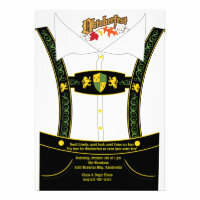 Some announcements have traditional German folk designs and patterns but I'm sure you'll find at least one with a pair of lederhosen on. 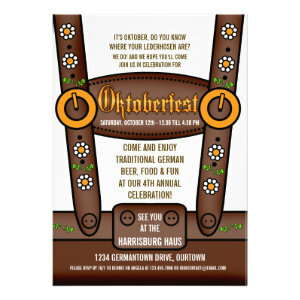 All of the Oktoberfest invitations can be personalized with your own text, font style, colour, layout and multiple choice of paper types and finishes. So you can have the perfect party invitation for your special celebrations. 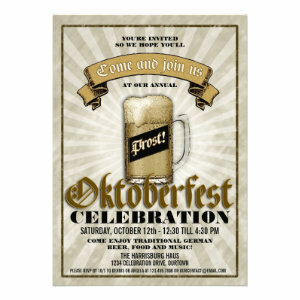 Whether you are organizing a larger festival or a smaller party for family and friends our Oktoberfest invitations are suitable for all occasions and the discounts on bulk ordering are a great way to invite larger numbers of people for a more reasonable price. 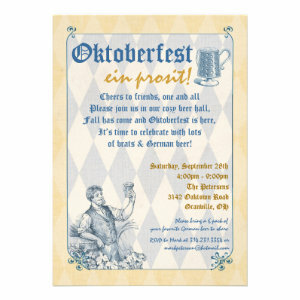 Get your Oktoberfest celebrations off to a flying start with these fun Oktoberfest party invitations.